Sometimes we all get in a bind with what to fix for lunch. My hubby usually just likes a quick sandwich to take to work, and then some raw veggies or the occasional side of chips, etc. I would get so bored having to eat a sandwich every day for lunch. I am more of a wrap girl. I can put anything from grilled veggies, to hummus and never get bored with them. I wanted to share a few combinations that I have come up with of healthy lunches that will keep you feeling full and satisfied. Cook quinoa as directions on package, but add the garlic with the water (or vegetable broth). 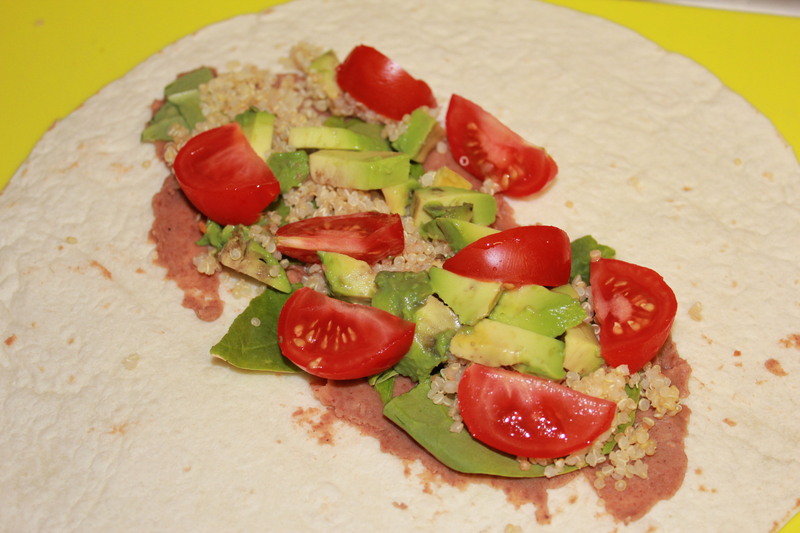 Once it has been cooked, squeeze the juice of one lime over the cooked quinoa and mix it in. If you want you may add salt and/or pepper, but I usually just leave it alone. 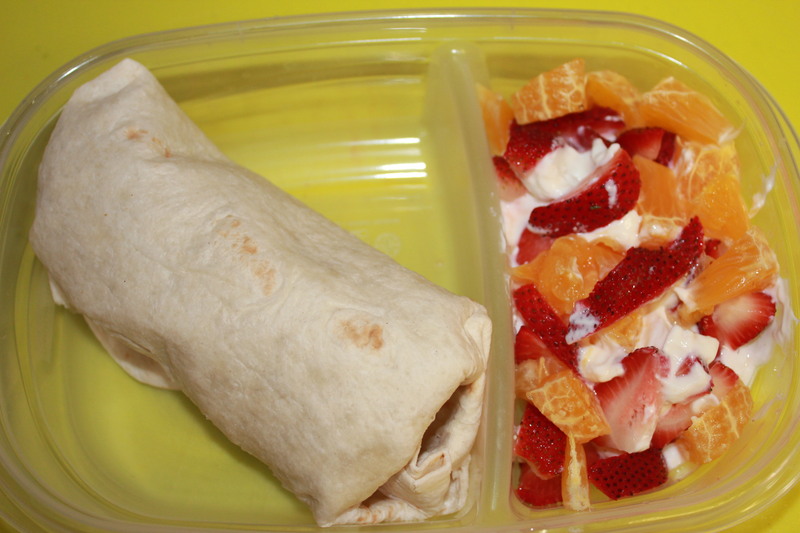 Okay now that you know how to do that, here are two different lunch combos, that are both delicious and nutritious! 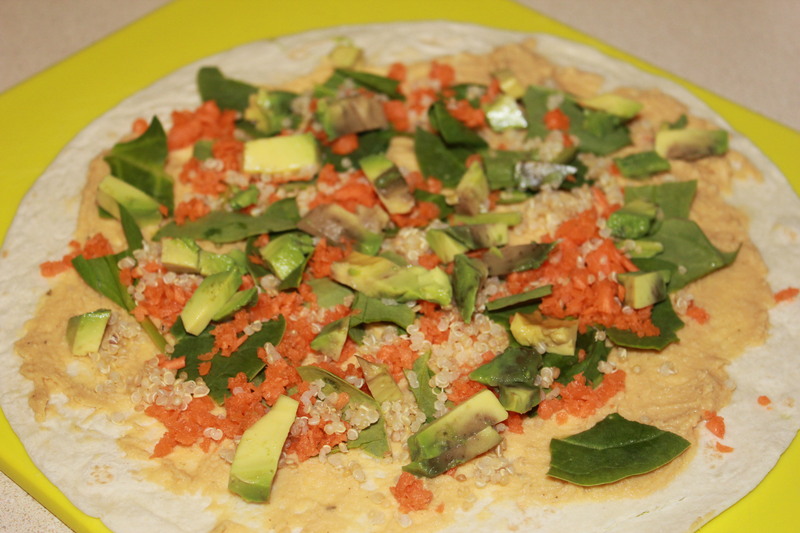 Take your hummus of choice and smear a thin layer all over the wrap. Add chopped carrots (I put a handful of baby organic carrots in a food processor), some chopped up baby spinach, chopped up avocado, and sprinkle a healthy portion of the zesty quinoa (recipe above). 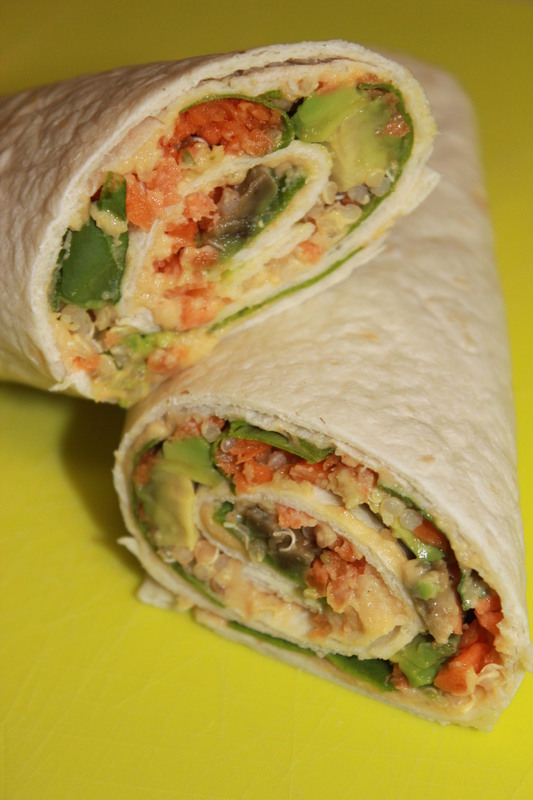 Starting from one side, roll up the wrap and slice in half. Now, as a side dish to this delicious meal, I sliced some Campari tomatoes and olives. Mix together with basil (fresh basil is the best, but I don’t have my basil plant up and going just yet, so I had to do dried) and drizzle with olive oil. Yum!!! As a side dish for this wonderful dish, I took Greek yogurt (you can use either plain or vanilla. or whatever you want), and I slices some strawberries and oranges to mix in. Now something a lot of people don’t really think about…What to drink with your lunch? You spent all that time thinking of how you could create a healthy lunch, you better not go grab a pop!!! [soap box time, sorry] Pop (or soda as I should call is since I moved to the south) is not healthy in any way shape or form. Not even diet, the artificial sweeteners can cause cancer and the carbonation is not the best thing for your body. … okay, my rant is over. 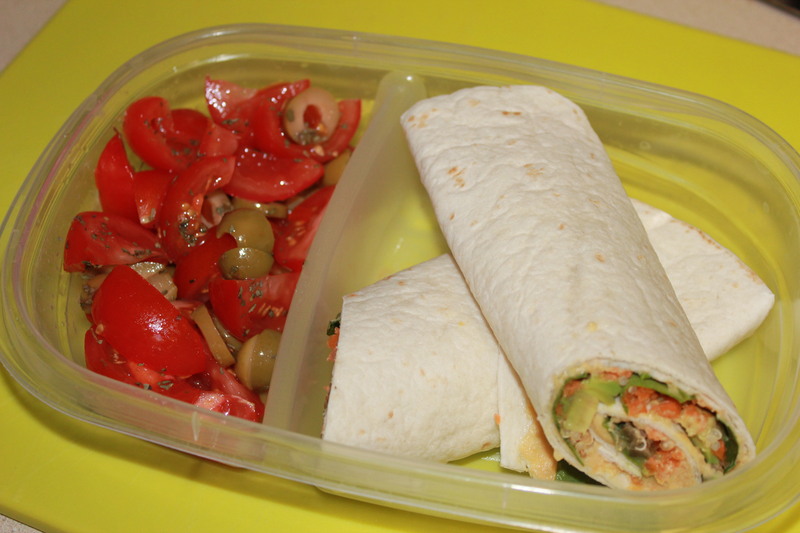 There are several healthy options to take, but since I did two lunches, I will show you what I took with them. Oh, Vita Coco!!! Love this beverage! 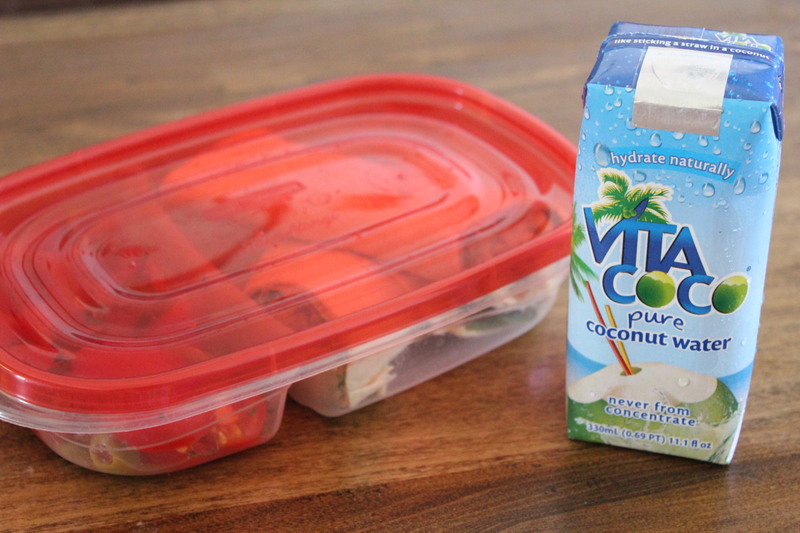 For some reason I am not a fan of Zico, but Vita Coco is a favorite of my little family here. Even my baby girl loves this stuff. Costco sells them in big packs of personal sized drinks, which is ideal for taking for lunch. This is my option that I usually take. I love my reusable up. It is mine, I know where it has been, I know that I have washed it, and also it has pink paisleys all over it. Makes me happy. Anyhow, water with lime juice is my favorite. I have a hard time drinking regular water, but it doesn’t take much lime juice to add flavor. Water is quite adaptable, you can squeeze lemons, mango, lime, etc. in it and it takes it to a new level. 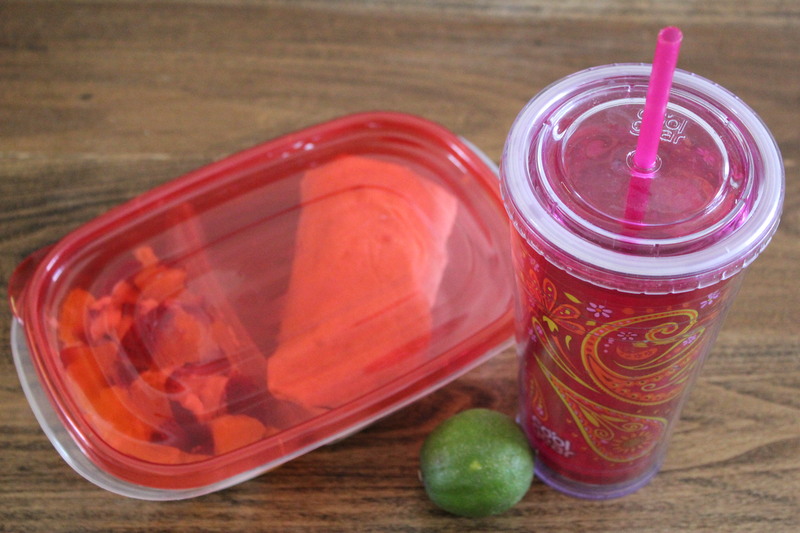 Let me know what type of lunches you like to take with you throughout your week! I love having different options and ideas.